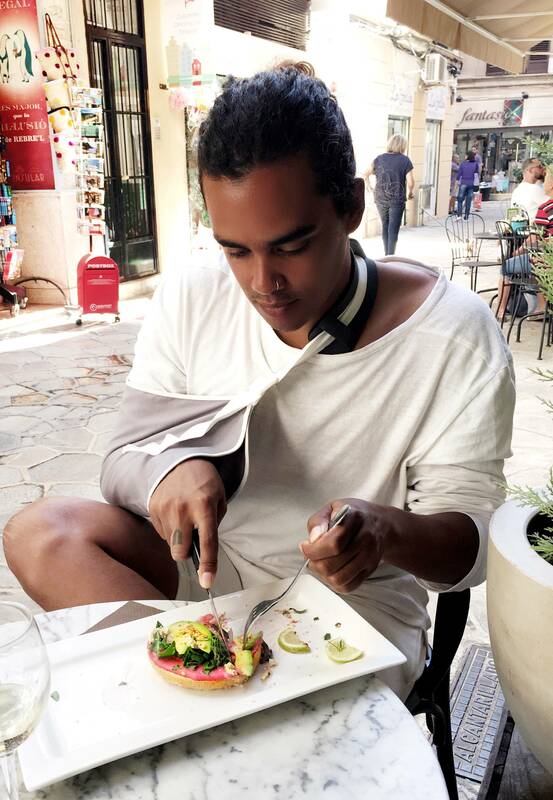 After having had a nice vacation on the Mallorca I have to make a post on some of the vegan food spots located on this beautiful island. Now of course I couldn’t go on a vacation without checking out some of their vegan food spots, right!? 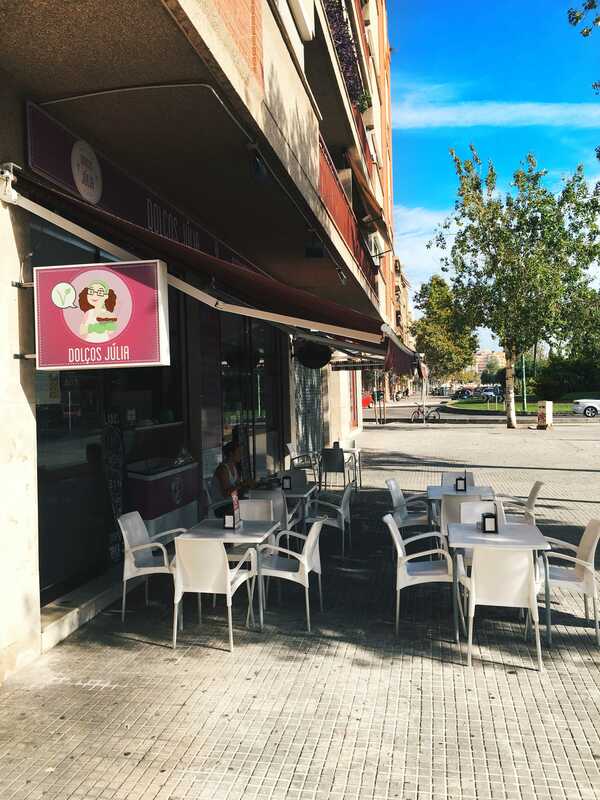 One thing I found out during my stay and searching for vegan food on-line is that Mallorca is actually a very, very vegan friendly place to visit. Of course not all the little coastal cities have vegan restaurants, but there was some major vegan food loving going on, on this beautiful Island. This for me came as a surprise, for some reason I expected a lot of tapas and paella and no vegan food apart from some fruits and fries, I really don’t know where that ignorance came from, but you could imagine my delight when I found it to be quite the opposite. Thanks to the internet it came clear to me that there were maybe even more vegan food spots in the capital of Mallorca then in my home town, they even had a fridge full of fake meats and cheeses in a pharmacy! As soon as I entered this lovely little vegan bakery/restaurant it immediately was love at first sight! I was being greeted by a worker who was very friendly, and spoke little english, but it wasn’t a problem because almost everything (if not everything) at this place is vegan, so there is no need to ask if there could be any animal products in their food. 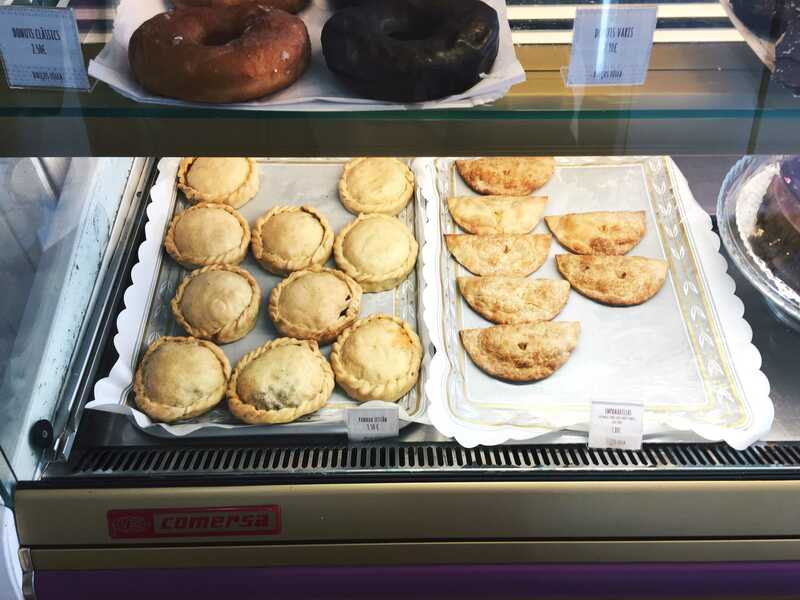 My eye immediately met with the showcase displaying some their most delicious products, I was especially drawn towards their donut and the seitan pastry, which naturally I decided to take! 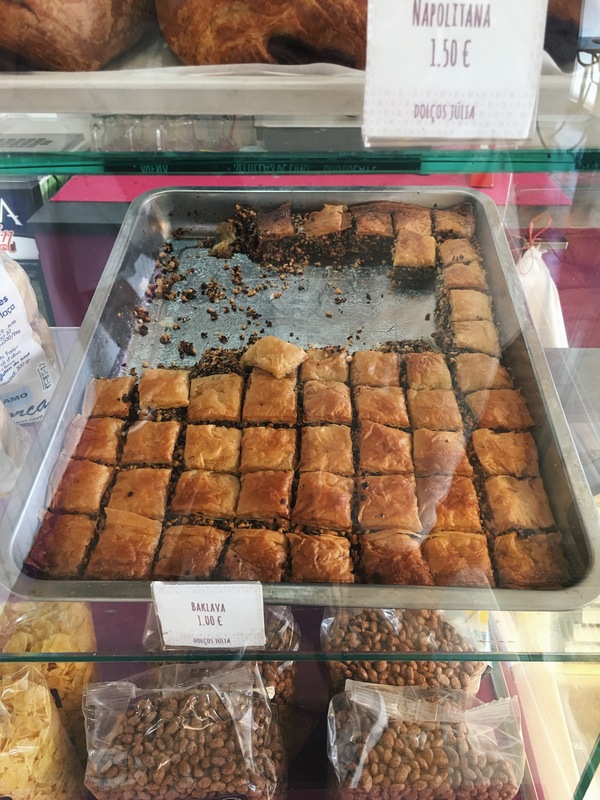 I also remembered my mother and sister liked baklava so I took some baklava for them as well, with most of it ending up in my own belly. I didn’t go alone and was accompanied by my brother-in-law, who took a vegan croissant with jelly and an empanada. 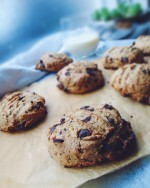 Apart from deliciously baked goods they also sold burritos, hamburgers and other vegan products like cereals. The seitan pastry and the donut were my favorites followed by the empanada, the baklava was delicious as well and although I considered the croissant good, it was a bit dry. 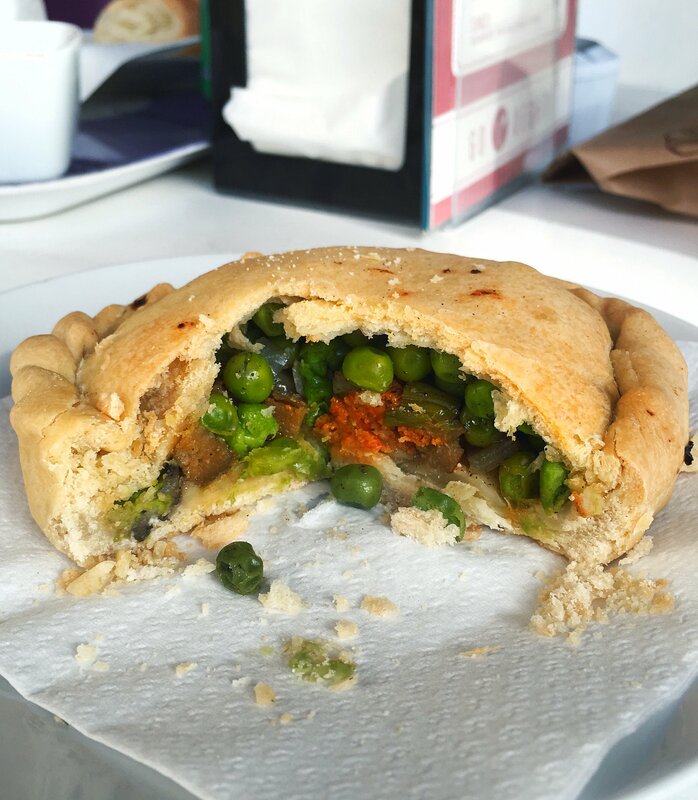 The panada seitan had a delicious filling of peas, seitan and what I identify as something including sun-dried tomatoes, I know, I know, that’s a very vague description, just trust me when I say it was good! All in all I would definitely return the next time I’ll be in Mallorca! 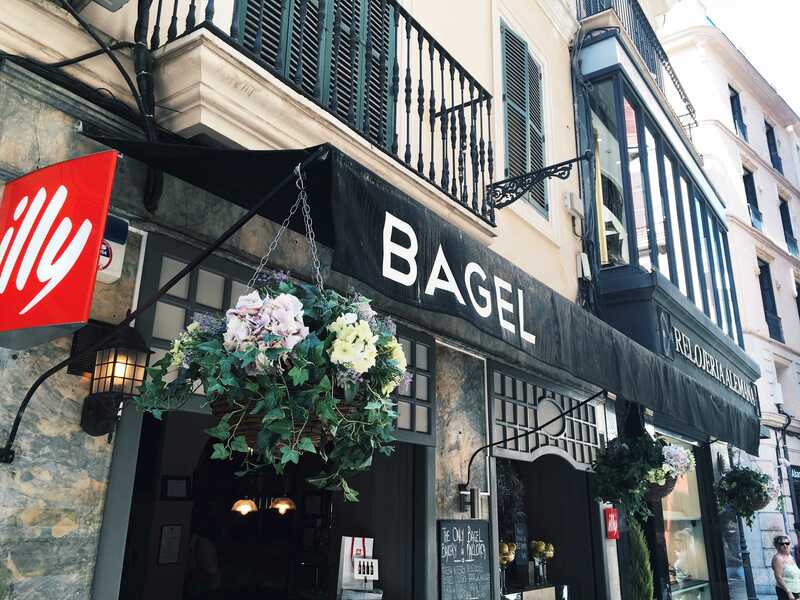 The next place we ate was Bagel, which is found in the middle of the shopping centre in Palma. The people working here looked very dapper and the place had an overall “sophisticated” feel going on. I asked one of the workers if they sold any vegan options (I already knew they did, just checking I guess) and apart from two vegetarian menu items every single thing they sold was vegan. The staff spoke fluent english and were friendly. Their menu included a lot of vegan pies, bagels and wraps. My first choice was the bagel with a vegan schnitzel, but while waiting to order I saw the lady next to me ordered a bagel with a beautiful pink humus and bright green avocado, so guess what I did… well I ordered the same of course. How can you not order something so bright and colourful!? Now will it taste just as great as it looks, that’s the question, and in this case it was a big win! I honestly don’t think I’ve ever had a more delicious bagel. 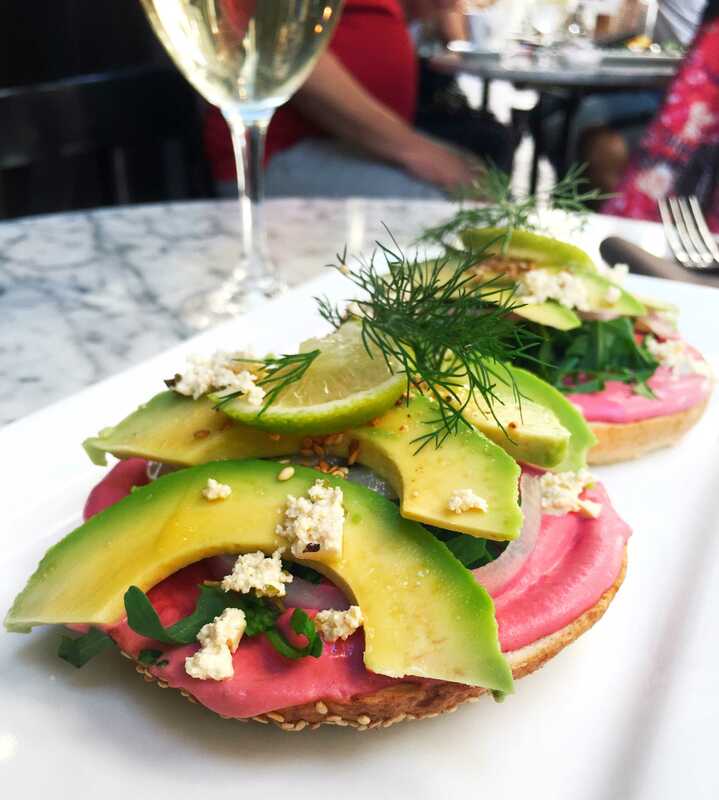 The bagel came with a bright pink humus topped with arugula, onions, perfectly ripe avocado, tofu feta (yes! ),dill and toasted sesame seeds, simply put all of the things I love in a salad, but now on a bagel! Well now I’ve got two food spots to revisit the next time I’ll be back on Mallorca. Now these were just a few of the vegan food spots found on Mallorca, so far its been very promising and I can’t wait to return to the beautiful island and go on some more food adventures. Let me know if you like these kinds of posts, cause I’d love to share more vegan food spots, most of them being in The Netherlands as this is where I life, feel free to let me know in the comments below.